Freeman Technology, the powder characterisation specialists, will be hosting a ‘Powder Flow Seminar’ on the 18th July 2018 at the Hilton Birmingham Metropole, UK. The free one-day event will introduce delegates to powder characterisation and its relevance to industry. A key part of any powder process is understanding how powders behave when subjected to consolidation. It is crucial for the development of effective storage and processing strategies. Freeman Technology is pleased to announce the release of ‘Polymers for 3D Printing’. Selective Laser Sintering (SLS) is an additive manufacturing technique typically used for rapid prototyping and low volume production of functional components. Freeman Technology (Kobe City, Japan), a global leader in the field of powder flow testing, will be exhibiting new instrumentation at Interphex Japan in the Materials Process Zone of East Hall 3 (27 – 29 June 2018). 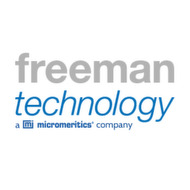 Freeman Technology will be showcasing material characterisation solutions at Achema. The solutions have been designed to optimise process performance, increase productivity and improve quality in a diverse range of sectors. Season's Greetings and a Happy New Year from all at Freeman Technology. We wish you a prosperous 2018 and look forward to working with you in the coming year. Please note our offices will be closed from 22 December 2017 to 2 January 2018.